Loving wife, mother, grandmother, great-grandmother, sister, aunt and friend, Betty, 76, of Kempton, PA, died peacefully at her home with her loving husband, Donald by her side on March 3, 2015. Born January 21, 1939, in Easton, PA, she was a daughter of the late Frank Barrese and Gladys Drogo. She graduated fron Easton School. As a result of her passion to help the powerless animals in the world, she and her husband started a chapter of the Humane Society inWinfield, Kansas, a place that they made home for over 30 years befor retiring and returning to Pennsylvania. Betty was also very involved in the Winfield Community Theater where she directed and starred in various productions. She worked for 10 years as the assistance director at the Winfield Recreation Center. She was also very active in the Holy Name Catholic Church in Winfield. She loved to play bridge and really enjoyed more than anything sharing good times with good people. Betty will be missed by her husbnand, Don; her daughter, Donna; her son, Thomas and his wife Suzanne; her grandson, Todd; her granddaughter, Jordan; and her great-granddaughter, Rilee. She also leaves behind her sister, Constance Kinyon and her husband Steve, her sister, Anna Barrese; her brother Edward Barrese and his wife Jean Keating; her nephews, Steven Kinyon, Michael Kinyon and Doug Barrese; her nieces, Debbie Bruce, Tina Kinyon, Maria Kepniss, Corrine Davis, their spouses and their children; as well as many friends who all morn the passing of this beautiful person gone too soon. 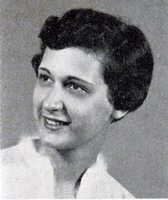 In addition to her mother and father, Betty was predeceased by her brother, Louis "Sonny" Barrese. Private services will be held at the convenience of the family. Arrangements are by the Strunk Funeral Home, Inc., Wilson Borough. Offer omline condolences at www.strunkfh.com.